Wedge sandals Filipa are crafted from silver braided raffia and grey suede, and have a buckled-fastening ankle strap. 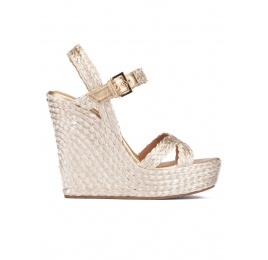 The platform front makes the wedge heel feel more stable and comfortable. This metallic style is suitable for day and night, and can also become a bold bridal design. Reference: AF611 trenza rafia silver.